Light Kinetics - LED Lighting & Renewable Energy Specialists: Why LED? LEDs or Light Emitting Diodes, of any size or shape, can be quite easy things to work with once you know a few basic things about them, about thermal management and about electricity. LEDs are, basically, a bit like normal light bulbs. You pass electricity through them and they (the semi-conductor material inside them) glow. If you pass too much electricity through them or you don't manage the heat they generate, their lifetime is reduced or the simply die. There are some important differences between LEDs and incandescent lamps, though. First, LEDs are diodes, so they have polarity; they only work one way. 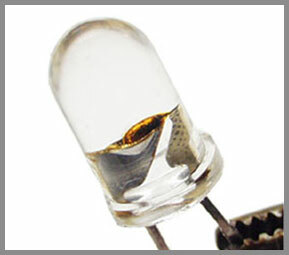 Ordinary LEDs (non-surface mount LEDs) have a long leg and a short leg, as they come from the factory. The long leg of an LED is the positive one. If you connect the thing backwards, it won't do anything. It won't be hurt, either, though, unless you apply rather more reverse voltage than the LED normally runs from. Anyone who's assembled a computer and connected the case LED plugs backwards will know this already. Second, LEDs need some resistance in series with them, either as part of the power source (if it's a small battery, for instance), or as a separate resistor. This is because LEDs have a natural death wish. Incandescent lamp filaments have a positive temperature coefficient of resistance; when they get hotter, their resistance rises. They get very hot in normal use, and their operational resistance is much higher than when they're turned off. Like, more than ten times as high. LEDs aren't like that. They've got a negative temperature coefficient of resistance; the hotter they get, the lower their resistance becomes, so they warm up in normal operation - they're not magic 100% efficient electricity-to-light converters, but waste some power as heat, just like everything else. 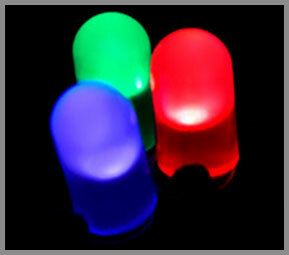 The big difference with LEDs though, is that the light they DO generate, is generated as forward light (forward lumens). This presents both advantages and challenges. If an LED is already passing enough current that a bit more power dissipation will kill it, and there's nothing - like a series resistor - to stop the heat-related resistance drop from allowing the LED to dissipate more power, you've got a situation called "thermal runaway", and your LED is not long for this world. Overdrive an LED relatively gently and it'll briefly emit colours rather higher in the spectrum than the one it's meant to produce, and then die, with a very small sad sizzling noise. The thing you are left with after this may be referred to as a "friode". If you overdrive an LED brutally, it'll still end up as a friode, but it will in the interim briefly function as an SED, or Smoke Emitting Diode. Ex-SEDs are always open circuit - they don't pass any current - but more gently killed LEDs can end up short-circuited, which is worse. When a shorted LED is in a series string with other LEDs, they get to see all of the voltage that was meant to supply the whole string. This, of course, accelerates their own death. or come to a Light Kinetics seminar on LED Lighting.